Didn't see this posted, sorry if it was. Needed a urgent replacement phone today so I went to Best Buy in Richmond, BC to see their promos for the new S10 and S10+. I have the Koodo $40\8gb plan. The rep told me as a hardware upgrade, I am eligible for their S10 and S10+ trade in promo on a medium tab. In fact the rep had the exact same Koodo plan. S10 128gb is $749.99 upfront on a Koodo medium tab and you can trade in any working phone with no damage for $320 off. I asked if I can trade in an old Blackberry Q10 and he said yes. In addition, he said if your phone has actual trade in value, you get additional discount. 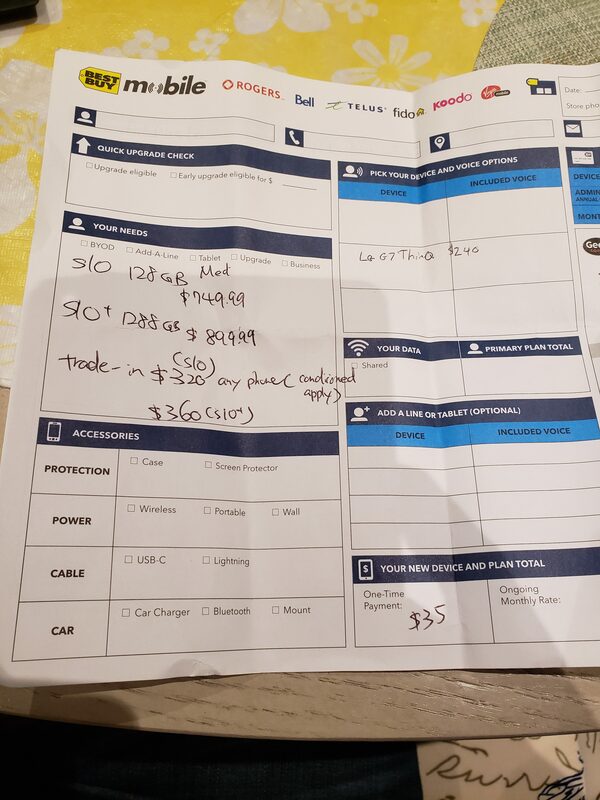 For example, he said an LG G7 ThinQ had a trade in value of $240 so it'd be 240 + 320. S10+ 128gb is 899.99 upfront on a Koodo medium tab and $360 off for trading in any working phone with no damage. With the LG G7 ThinQ example, you can basically get the S10+ 128gb for 299.99 upfront ($600 off with trade in) on a Koodo medium tab. Plus $35 activation fee. Best Buy website only mentions new activation but in store the rep told me it works for hardware upgrades for Koodo at least....YMMV with the other carriers as I didn't ask about them. So did you get the phone? Are you eligible for a med tab on your current plan? Pretty sure a g7 thinq5is worth way more than 240..
How is your $40/8GB plan eligible for a medium tab? I have the same plan and it's now only eligible for a tab small. Not sure. Was this a recent change? I did a HUP on Koodo medium tab on my 2nd acct with the same plan 1.5 months ago and had no issues. Agreed, it was just an example. Although LG phones apparently have horrible resale value. I've read ppl seeing listings on kijiji for under 400. Thanks...apologies if it is. I tried searching and looking through all the best buy threads and didn't see any galaxy ones. Mods please delete if it's a repost. There's a $360 tab balance to pay off as well correct? Any chance of getting the Google home or geek squad $100 promo as well? Correct...360 tab balance for medium tab. I believe the rep said the google home promo is for new activations only? Don't quote me in that though. Yes, Koodo very recently changed the $40/8GB plan's tab eligibility from medium to small. Yet, Ottawa/ Quebec customers on the $49/6GB plan are eligible for a large tab. I've stated it before only in Canada can getting a discounted cell plan foster and sustain a blackmarket. Just came back from Beat Buy trying to do a Koodo HUP on S10+, but my $49 with 6 GB Quebec plan is not eligible any more. I have a Toronto number on it. The system did not let me stay with the same plan. So I left. Very frustrating. Interesting...thanks for the heads up. The best buy rep never mentioned it. He said the plan was eligible.